Ranchers have many different ways of feeding their cattle in the winter months. 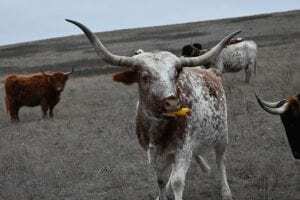 Some may scatter ear corn, place soy hull pellets, shell corn or ground corn in feed bunks, grind hay using a variety of bales, or lay a trail of cake. 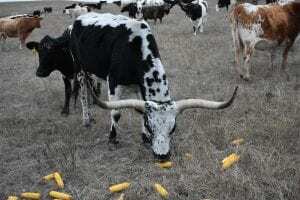 Ranchers may use ear corn so the cattle have to work for their food, and that keeps them warmer. Others choose feed that they think will provide more protein. Whatever the method or kind of feed, all of the ranchers are gearing up for calving season.